Diwali is all about spreading love and happiness in your loved one’s life. So, if you are looking for some heart-touching Diwali handmade gifts then FlowerAura, brings to you a wide variety of meaningful handmade gifts for Diwali, From handmade chocolates to greetings that will help you convey your best wishes to your loved ones in the most beautiful way. Every year, the auspicious festival of Diwali is celebrated by Indians all over the world. Unlike most of the Indian festivals, the vivacious festival of Diwali is not a one-day affair because the revelry of this festival continues for five days. Diwali is commonly known as the festival of lights as it inspires people to keep faith in the power of good and at the same time, it signifies no matter how dark it is, the light of a single lamp can enlighten the path of one's life. On this special occasion, people decorate their houses with diyas, lamps, candles and other multicolor designer strings of light bulbs. People also exchange Diwali gifts with their family, friends, and loved ones. So, if you are looking for unique Diwali gifts for your loved ones then, you are in the right place. FlowerAura offers you a wide range of Diwali handmade gifts available in affordable price and are sure to stand out from the crowd. Now, you don’t have to go outside your house to do your Diwali shopping as you can now order handmade Diwali gift items for Diwali online from FlowerAura comfortably seated at your home. If you are looking for some real heart touching Diwali gift ideas for your special ones, you should count on our handmade Diwali gift ideas. We, at FlowerAura, have an exclusive collection of homemade Diwali gifts that are sure to convey your heartfelt emotions for your loved ones in the best possible manner. From handmade Diwali sweets to cookies, chocolates to homemade Diwali cards, our range of handmade Diwali gifts are for all. Whether you are looking for handmade Diwali gifts for friends or family, handmade Diwali gifts for boyfriend or girlfriend, we have gifts for all. So, express your love for your close ones in a unique way with handmade gift ideas for Diwali by FlowerAura. 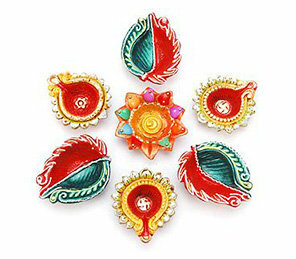 Uplift the spirit of your celebrations with the most beautiful gift range of handmade Diwali gifts from FlowerAura. The best part of sending homemade gifts for Diwali is that they are really heart touching. Now you might be wondering to know the reason behind choosing FlowerAura. Right? Well, FlowerAura has always been a very famous name in the world of gift shops. FlowerAura does not only provide you with a wide range of homemade Diwali gift ideas but it also provides you an express delivery service through which you can now send Diwali gifts across India. Yes, in case you cannot go out to meet your loved ones on Diwali, you can surely send them some amazing homemade gifts like Diwali chocolates and make them feel special. FlowerAura also ensures impeccable delivery services through which you can send a Diwali gift online in a hassle-free way even at the last minute. Another crucial advantage of ordering Diwali gift from FlowerAura is that it delivers your gift to your doorstep at the right time. Why Choose FlowerAura To Order Handmade Gifts For Diwali? FlowerAura ensures Diwali gifts delivery in Delhi, Mumbai, Chennai, Bangalore, Pune, Patna, Nagpur, Gurgaon and many other places. So, you can send a handmade Diwali gift across India and make the occasion memorable for your loved ones. With FlowerAura, you can avail same day delivery which claims to deliver your gift to your doorstep just within a few hours of your order placement. In fact, now you can send Diwali special cakes or handpicked Deepavali gifts at midnight via our midnight delivery services. Just imagine how happy will be your loved ones on receiving a Diwali gift from you in such a special manner. In case you are not comfortable with same day delivery or midnight delivery options, you can avail our next-day delivery service too. Other than our flexible delivery services, we also ensure our customer's free shipping benefit. So, this festive season, gift your loved ones something unique and something that they would love to receive. Order a handmade Diwali gift from FlowerAura and show your affection for your loved ones in a special way.